Don Pancho began his career in Cuba in the early 60’s working with his father, a wine and spirits merchant. After earning a degree in microbiology, he decided to pursue his passion for creating great rums. The Master of Masters, Don Ramon Fernandez Corrales, taught him the “Carta Blanca” method, the foundation of developing aged rums. In the 70´s as Director of the Cuban Beverage Industry, Don Pancho helped in the renovation process of the rum industry in Cuba, introducing modern technology, renovating the cask inventories and modernizing the plants and distilleries. He also helped to improve fermentation, production and blending techniques that set the standard worldwide with iconic products that can still be seen all over the globe. His work enabled him to travel the world and interact with different beverage industries such as Whisky in Scotland and Vodka in Poland. 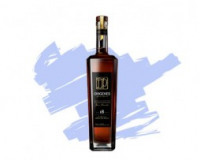 These multicultural exchanges developed his experience and skill and made Don Pancho the quintessential Master Blender he is today, with a unique and personal touch. In the mid 90’s Don Pancho discovered a neglected distillery in the Herrera region of Panama dating back to the early 1900’s. Beneath the overgrown grass, a copper column still was uncovered bearing a small plaque with the inscription “Cincinnati 1922”. Hard work and Don Pancho’s vision have now restored the Las Cabras distillery and transformed it into one of the great rum distilleries in the world.